If you have any Greek people in your social circle, you may have realized that Easter is the biggest holiday of the year for them. In the eyes of the Greek Orthodox Church, it is an honor to commemorate the fact that Jesus died on the cross for our sins. For the Greek people, they’re ready to celebrate. After weeks of careful fasting and prayer, they’re eager to break the fast and finally eat foods that have been deprived of them. Since Easter is such an important holiday to the Greeks, there are many traditions that have developed because of it. Here’s a summary of some of the most prominent. Preparation for Pascha (Easter) begins at the start of Great Lent. 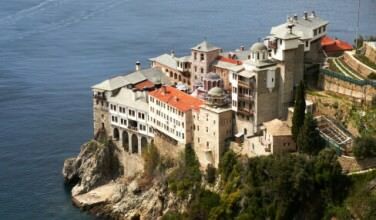 Orthodox Christians fast and pray regularly during the forty days of lent and also during Holy Week. For many Greeks, the church service that takes place in the evening of Holy Saturday is the most important one. However, in the eyes of the church, they’re all equally as important. Have you ever heard Greek people greet each other at Easter by saying “Christos Anesti?” This means, “Christ is risen.” If they say this to you, impress them by following it up with the proper response of “Truly, he is risen.” In Greek, this is translated to “Allithos Anesti.” The first time this is said is after midnight on Easter Day, usually during the evening church service. Just before midnight, the church goes completely dark. After midnight, the church lights up with candlelight as people light their tapers from their neighbor’s and begin chanting “Christos Anesti.” The traditional hymn is also sung. Translated, it means “Christ is risen from the dead. By his death, he has trampled down death. To those in the tomb he gave eternal life.” This hymn is sung for several weeks after Easter during the church services. Greeks are eager to break the fast they engaged in during Holy Lent as soon as possible, so many of them eat a meal right after they get home from the Holy Saturday church service. The traditional dish to serve during this meal is magaritsa, which is a soup that is made from the organs of the lamb that will be prepared for the main feast. However, some families opt to eat their big Easter dinner during this time. If that is the case, they’ll likely still serve magaritsa. 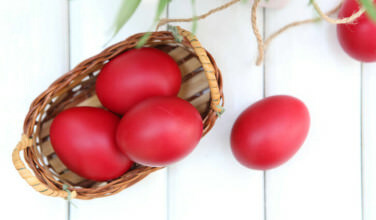 If you’ve attended Greek Easter dinner, you may have noticed that all the eggs are dyed red and there are no pastel colored eggs at the table at all. This is because the egg has come to symbolize Christ’s tomb, which has been stained red with His blood. This is a visual reminder of the fact that He died on the cross for our sins. 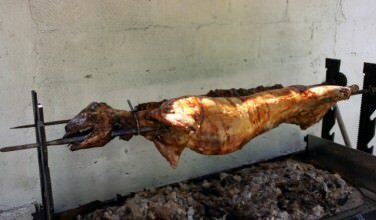 Roasted lamb is the traditional meat of choice on the Greek Easter table. It is normally seasoned and prepared on a spit, or souvla. In regions of Greece where lamb isn’t readily available, goat is served instead. The reason why this is served is because according to the Apostle John, Jesus is the Lamb of God. He died on the cross as a sacrifice for our sins. Eating lamb honors this. 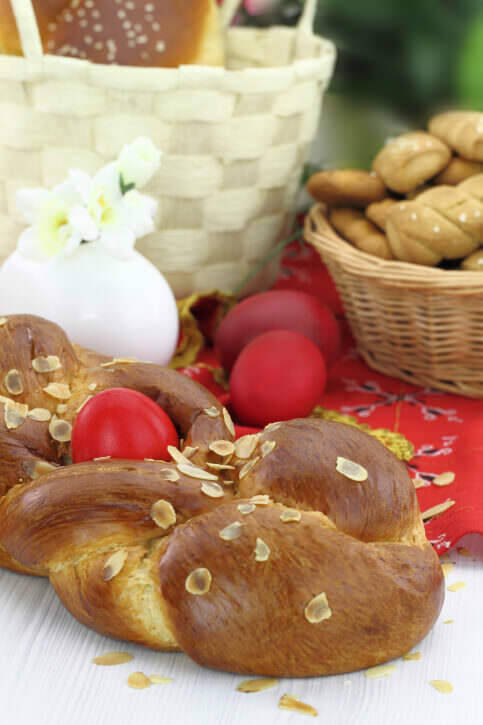 Another dish that is present at the Greek Easter table is tsoureki, the traditional sweet bread. You’ll recognize this bread because it will likely have a red Easter egg baked right in the center. This bread contains several ingredients that were forbidden during Great Lent such as eggs, butter, and sugar. 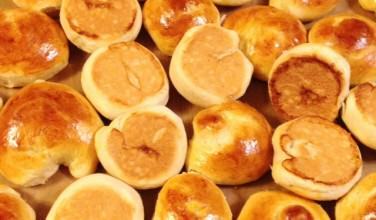 Some families take this one step further and use the traditional tsoureki dough to make small sweet rolls for the guest to enjoy. Now, when you attend Greek Easter, you can impress them with how much you know about their culture!